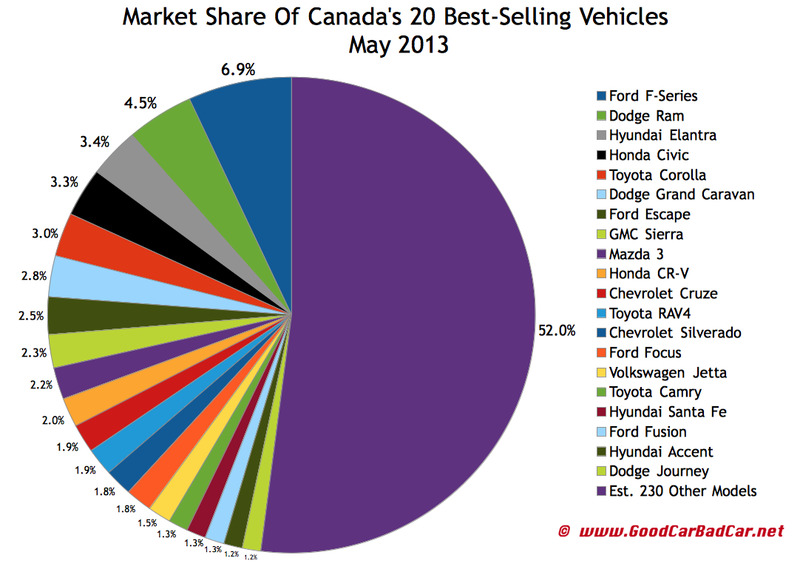 Up from five in April, seven of Canada’s 30 best-selling vehicles in May 2013 were Hyundais or Kias. Six of those seven vehicles recorded year-over-year improvements. Two set all-time monthly sales records for their respective nameplates. One of those monthly records was set by the Kia Forte, which had set its previous record exactly one year ago. Sales were up by just 28 units in May 2013, but it’s important to keep in mind that this record was set during the same month in which the Forte’s Hyundai partner, the Elantra, also set a monthly record. 1400 of the Forte nameplate’s sales came from the new model which GCBC reviewed back in early May. The Elantra’s record, meanwhile, was enough for it to keep its claim on Canada’s best-selling car crown. Naturally, the 36% year-over-year increase posted by Hyundai Canada’s top car wasn’t nearly enough for it to challenge for best-selling vehicle status. The Ford F-Series sells more than twice as often as Canada’s best-selling car. And sales of the Ram Pickup were 32% stronger than the Elantra’s volume. Incidentally, May was the highest-volume sales month ever for the Ford F-Series. And for the Ram, as well. It’s been that kind of year. Compared with April, the Kia Optima, Toyota Matrix, and Chrysler 200 have fallen out of the top 30. Replacing those three cars were the aforementioned Forte, Hyundai’s Tucson, and the Hyundai Sonata, too. Compared with last May, when the Matrix, Optima, Ford Fiesta, and Nissan Altima were in the top 30, the Mazda CX-5, Nissan Sentra, Tucson, and Sonata accounted for last month’s changes. You can always select a make and model at GCBC’s Sales Stats page to find historical monthly and yearly sales figures from both Canada and the United States. Pertinent links are clickable at the bottom of this post, but you can also find related links at the Best Sellers page. Below, GCBC has grouped automobiles of all types into the list of Canada’s 30 best-selling vehicles from May 2013. * Santa Fe doesn’t include the Santa Fe XL, which Hyundai lists separately. Combined, Santa Fe/XL sales were up 28.3% to 2723, up 23.7% to 11,158 through five months.